Graph each line on the same coordinate axes. â€¢ The lines intersect at exactly one point. The system has exactly one solution. The solution is the coordinates of the point of intersection. â€¢ The lines do not intersect. The system has no solution because the lines have no points in common. The system has infinitely many solutions. 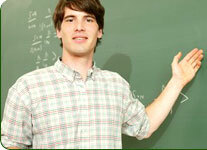 The solutions may be stated by writing one of the equations of the system.